With the launch of multilingual videos, migrants of Victoria now have a greater and easier access to information regarding their consumer rights. Heidi Victoria, Minister for Consumer Affairs launched a series named ‘My Consumer Rights’. It consists of videos in 7 languages about responsibilities and rights of consumers while buying services and goods in Australia. Ms Victoria said the videos explain the basic Consumer Laws of Australia using universal symbols and gestures, and simple messages. She said that Australia’s trade practices are different from many foreign countries, and many new refugees and migrants may not appreciate their responsibilities and rights under consumer protection laws of Australia. She added that these innovative videos are crafted to help the multicultural communities of Australia in understanding what they can expect while purchasing services and goods in the country, in a way that is easy to understand, accessible and wide reaching. She stated that to get this important information across, the use of universal gestures and symbols combined with simple messages is an enormously effective way to overcome language barriers and to help describe what can be complex subjects for people who are new to the consumer marketplace of Australia. This project is a joint consumer awareness initiative by all of Australia’s federal and state consumer protection agencies. 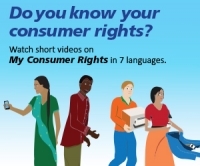 The videos of ‘My Consumer Rights’ are available in Arabic, English, Dinka, Farsi, Karen, Tamil and Nepalese. These videos help educate immigrants on topics like refunds, shopping rights, contracts, warranties and guarantees, lay-by agreements, lodging a complaint and resolving issues under the Consumer Law of Australia. Ms Victoria said the videos are an important resource in supporting immigrants from linguistically and culturally diverse backgrounds.